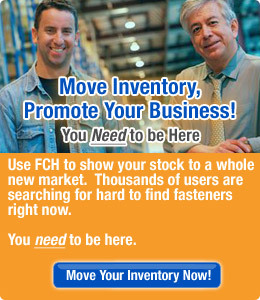 At The FCH Sourcing Network you will find hundreds of thousands of fasteners within our database of surplus, odd lot, slow-moving and hard to find fasteners that conform to the IFI specification. Bolts & Cap Screws by IFI Specification - Hex bolts and hex cap screws feature a large fastener head for distributing clamping load. Heavy hex bolts feature a larger head. These fasteners are used at high tensions and temperatures. Cap screws have a washer face underneath the head and are used in precise applications. Heavy hex bolts are commonly used to make structural connections in buildings, bridges, and railways. Nuts by IFI Specification - Nuts, or mating fasteners, are available in hundreds of different shapes and sizes for any project or application. Varieties are normally hexagonal or square in shape, and have either coarse or fine internal threads that correspond to those of a mating bolt or screw.